1): There will be documents of our business plan. 2): Others are operational documents, lists of hotels, lists of restaurants, lists of car-rental and drivers for the taxi service, first for Mumbai, however similar sets for all service-clients (businesses that we will present to our patient groups) in the airport / hospital regions we decide for our operations. These initial lists will be copied over as they evolve into actual operational documents of the business. 3): Thirdly, we will need to build actual presentations, in Powerpoint, to enlist health providers; and also presentations for local restaurant and shopping providers as our service-clients. The health-care providers will need to know about our appointments and billing procedures. 3): We will create a client's guide pamphlet, in several languages, where upon we will present a map of the provider city and a list of local restaurants, local sight-seeing locations and points of interest. Histories and local flair. 4): Travel options, planned around the projected treatment plan for each patient, of local tours or India-wide vacation tour packages. 5): We may create a client HTML-page for use during and after their visit; and we will provide a direct cell phone, language correct help-line. Business accent will always be to patient care and customer satisfaction. All services will be planned and arranged to include profit for the indicare.net company. indicare.net will handle all billing operations, paying the various providers and taking moneys through billing of the contracting patients. We should create an outline for documents of agreement, or MOU between ourselves and the different projected service-providers, doctors, hospitals, hotels and restaurants. We have to define and analyze the hospitals and doctors we will approach, make contact and reach agreement with them to become indicare.net service providers. For each hospital and each doctor we will build our presentations for publishing and the web. We must acquire a materials packet of information for each provider, such as personal histories and work histories, -testimonies and pictures of their successes, etc. Therefore we should make a small work-sheet that we can present a prospective service provider to help them easily interact with us when putting together their "materials packet". We will need materials on their past cases. We will see if it is possible to do an interview and picture of satisfied customers to create a "successes packet" for each doctor. See "Institutions" and "Doctors" below. We will work with healthcare providers and present their services on the web. We must have a choice of languages upon entry and an excellent translation of our presentations for each. We may need to examine presentations in different languages for the potential of a culturally based presentation. Healthcare is accessible. Treatment can be proceed immediately, without wait..
Healthcare through indicare.net is accountable care, indicare believes in patient advocacy and oversees care, daily as it progresses. indicare will actively manage your treatment. It is important to know that indicare.net has seen to it that a full nursing staff is available from it's providers for patient care. One of the cornerstones of good hospital care is around the clock nursing. indicare.net patients have that solid feeling of well being from knowing that competent professionals are always at hand. indicare.net visitors should find choices for specialty on the home page. There should be pictures of the hospital and environs, the work theater and the doctors at work - for each specialty. A "team" picture. Emphasis should lay heavily on the validity of care, particular successes and professionalism. The institution: Acquire a materials packet and create a web layout for the individual institution and it's specialties. The web-layout will be our layout on our server, not a link to their web-site. There should be testimonials on the renown of the institution. Pictures of the institution and it's facilities. The methods and practices for sterilization. The doctors: Acquire the doctor's materials packet and produce a layout for each doctor. This will include his or her picture, perhaps pictures of the family and their family history, if compelling; the Doctor's leisure activities, his/her hobbies and outside interests. There will be a recitation of his/her education and clinical background; and of their ongoing medical and procedural endeavors. Teaching activities, what languages spoken, etc. How many organizations and professional merits received. The validity of individual merits and awards should be explained. What they are, what the awarding organization is and represents. We need a "successes packet" for each doctor. Successes packet: We need to build a presentation of medical successes for each medical field. We want to publish statistics, of course, but we also need to pursue interviews and pictures of satisfied customers. For instance, a cosmetic surgeon will have before and after pictures. We would need permission to place some of these pictures on the web under his presentation. Links: There should be links on the left from every page regarding a patient's stay during their treatments. These will be either in-hospital for surgery or non-ambulatory patients or in hotels for others. Depending on the page of access, cardiac, cosmetic surgery, dental care, etc, the facilities presented from these links should reflect the city and it's indicare service. Links should be arranged so that a browsing web-visitor will find an immediate return to his/her original point of interest. There should be links to any specialty. There should be a link to articles on India's culture and history. There should be a link to the tourism and vacation page. There should always be a link to the home page. There should always be three links to Hotels, Restaurants, Tourism - see below. The home page should have links to all facilities and participating hospitals. We will create feature pages on each with full pictures and identification. These are accessed either by clicking on one of the specialty links or by clicking on a city link, presenting the facilities, or by clicking on a facility link itself. These pages will be on our site from our server. There should be a link to a graphic representation of the relative quality of health care in all countries; comparing USA, India, Thailand, Mexico and all foreseeable competitors. 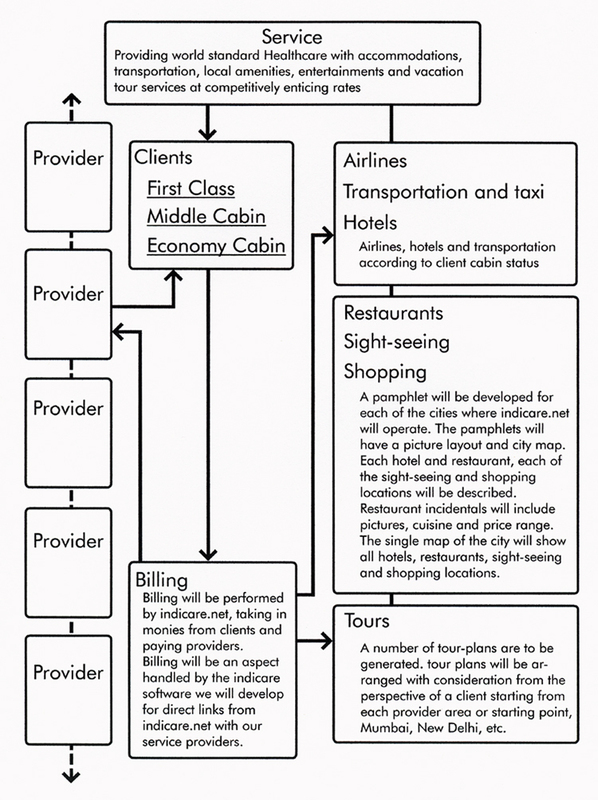 Included will be a simple graph of cost to service ratio that also accounts travel. Home page: Specialty links predominate on the left. Facility links are from thumbnails in the middle center. City links are in the lower field on the left. Three picture-links predominate the high center. 1): hotels and car service - A cursory view of nice facilities. Links go to individual cities. 2): restaurants, entertainments and sight-seeing and care service. A cursory view of nice dinning. Links go to individual cities. All pages should have full left-side links. "Hotels" above, should have links to hotels of the cities. "Restaurants" above should have links to restaurants the cities. Each of the City links will have a map, hospital facilities and sight-seeing features. The city should be presented in pictures for it's particular character. We will need to produce contact software that allows initial communications from patients to doctors and hospitals, through indicare. This email communication, is also to be forwarded to us and will allow us to know that our work has yielded a potential client. We should have MOU with doctors and hospitals regarding fees to paid us from all clients originating from our indicare.net source, and have placed their healthcare to that institution as a result. Most clients will want our services to streamline their health vacation to India. The ease of experience created by the various elements of indicares' service-line of customer support are the building blocks of a successful health tour and, in the long term, the very cement of the reputation of India's new healthcare boom. Shinning reports of a good experience. We will trumpet these reports on our web-site with full interviews and quotes from satisfied customers; a picture and their stories and experience. We will encourage customers to remain within email and phone contact with indicare.net - or within our contact software, by establishing under MOU with the healthcare providers the necessity and importance of indicare.net's role in shepherding each client's India stay. There are three directions in developing client travel. Contracting private carriers, buying or leasing a small fleet of private planes and using commercial airlines. We should plan for all. Air-travel is an ancillary business and should be set up to coordinate within our software operations, the client plans for hospitalization, cities and touring. Our software will book and coordinate flights. 1 - Therefore we may start an international airlines ticketing agency, contract such an agency or contract with an airline. We will create discount packages for our clients and business operations with contracting airlines. 2 - Flights for medical must be integrated with treatment plans and any client tour package. Therefore client packages must be established with treatment plans and tours considered into the initial client contracting plans. A list of airlines and reduced fare outlets should be examined for the potential of arranging exclusive contracting of indicare customers. There should be small pamphlets created for each city, in appropriate languages presenting local histories, Indian cultural, historical and religious backdrop for areas of visit. These pamphlets should be written with an understanding that they may be used by non-medical visitors and could be given for tour visits from another city. The pamphlets should have a city map on one side, with locations of hotels, restaurants, shopping centers and points of interest specified. We will need to visit and examine every establishment we intend to place into our pamphlets. Each listing should be simple and concise. The pamphlets should include local customs, as necessary, perhaps including local taxi payment instructions. Taxi instructions may have to be a separate document. We will create a list of hotels in every city hosting our client base arranged as to client cabin, First Class, Middle Cabin or Economy. We will arrange for the hotel services to our client-base, as indicare service providers. internet hook-up for hotel guests is not specifically necessary, although it might help some clients with their doctors’ schedules and their own daily plans. We might think about creating a private-view web-page for each visiting client for schedule reminder, floating note pad and email communication source. This may also be an available HTML record of the trip and services rendered. Of course, hotels must have telephone service. We will interview hotel management and take pictures to arrange a display for our pamphlet, brochures and the web. The display should include smiling faces, food service and amenities. Ease of access and proximity. The hotels will have indicare service internet-linked software to their front desk, if at all possible according to individual hotel internet access. An appropriate number of restaurants, located in a provider city, will be chosen so as to present to our clients a variety of cuisine; and for quality. Of restaurants accepting, we will meet with the restaurateur and partake in a meal. Having decided positively for the restaurant, we will create a picture portfolio, take interviews and write a critique for each establishment. This information will be edited and published. It may be published in various ways in various documents. Provider infortmation should therefore be arranged to a standardized docket. Each listing in the pamphlet should be simple, with cuisine and range of prices. We should try to enlist each restaurant as an indicare.net service provider if possible. We should endeavor of these restaurants, a percentage of profit; or acquire from them a price reduction for our clients. We might think about having restaurant coupons for reduced pricing. Senior's coupons are another possibility for bringing increased business to these restaurant providers. We may create an indicare "Dinner's Card" which would allow clients to charge meals hold patient dining to our billing department. The required funds-hold for such a charge system would also be advantageous for our yearly cash flow. Presented in the pamphlet, along with local histories, Indian cultural, historical and religious backdrop, there should be for all points of interest, a small description with a schedule of visiting times, admission and an estimated duration of visits. Local shopping malls and markets will be described and presented in the pamphlet. A small entertainments sheet could be provided. This would be a computer document that would be updated once a week from the newspaper and printed out for clients. Arranged - along with hotels - for each class, First Class, Middle Cabin and Economy. Arranged as options according to client preference and client treatment schedule. We should embark on the tourist business to the degree that tours need to be tailored to our clients and their treatment schedules. There are local tours and India-wide tours and vacations. We shall also contrive our tour presentations with non-patients in mind. 1): A range of destinations and seasonally specific tours should be researched for presentation in a tour brochure and web presentation. We should think to contract or out-source to established tour operators and vacation areas. Tour bookings must be done with attention that our clients will be satisfied with their experience. 2): Therefore, we need to find and approve good tour operators. We will seek to establish relationships with these tour providers as normal agents for their offerings and to book and coordinate tours with them against our client's treatment schedules, as normal business operations. This requires that we consistently update with the tour provider so that our scheduling of treatments and patient visit can be planned - at the beginning - to mate with any tour presented for our client's consideration. As well, some patients may plan their treatment to coincide with a given vacation opportunity, such as once-a-year festival, etc. We will need to establish, under MOU, the financial considerations with the tour operators. We will need to establish the computer communications with tour operators and web presentation regarding tourism. Our service will be marketed to the public on the web. We will also offer our services, of local hotels, car and driver, restaurants, shopping and sight-seeing as ancillary alternatives to outside or non-participatory hospital groups: As these groups may only offer plans of hospital suite patient housing. We will research and approach the large insurance companies as international health service providers. (See Aspects of Growth below). We will research and approach Indian insurance companies and explore becoming agents for sales to international and foreign markets, such as our patient countries, the USA, UK, Canada, European Union and the UAE. Once the service is operational for the full spectrum of medical services, we can advertise on national and international media and seek smaller, localized informational and news programs to include stories on our service and it's systems. Mainstream advertising in television spots in the USA will put our service and it's benefits to the forefront of attention. We need a solid software package for our operations, which includes secure communications, secure billing and bank communications. We need secure email communications. Under contract with each hospital and provider, of course, we need to have an interface that can be installed on the hospital's computer system. It should allow us the ability to see and operate the hospital and doctor schedule; and the ability to book to the hospital and book for the individual doctor. We will comport our software for a separate busniess, that of running the scheduling and billing of hospitals and mediacal facilities. The indicare operations should grow to include hospital maganagement services delivering bookkeeping, schedules and the full arrange of patient mangement and record-keeping. .
We will need to coordinate and run the client travel services through our software. The software package will include a data-base and should allow collating of data from all points and columns. The software needs to be open-ended as we should be able to bring online new business aspects as they are initiated, such as foreign insurance transcript and billing. We will need to address all providers. The software package should cover the various aspects of billing. The hospital bills us through the software. The doctor can bill through the software. Pharmacy bills through the software. We need normal review of all billing. We need, in the software, choices of document creation, - provider copies - patient billing - insurance - taxes - records. We will need patient management documents that apprise concerned departments of the care provider and also concerned indicare agents. For instance, the software should avail communications if a patient is to change hospitals, or doctors; or even for have a car available for shopping. We will need a system where a self-updating patient tour plan page is kept for each patient and lists any and all aspects of the health tour, both medical and travel. It should be up-dated by direct entry or by entries from all discrete locations. It should list the up-dates, who made them and when they were made. We need a method to double-check billing figures for correctness throughout. We may research and decide to have an indicare “Dinner's Card”, where clients can charge meals, transportation services, even hotel bills, etc , against their prepaid credit. Their secured funds deposit for this credit would add significantly to yearly cash flow. We will need to investigate liability insurance for our Medical Tourism business. We need to investigate exactly what aspects of health-care insurance have been applied toward medical tourism. It may be that one or more US insurance companies can already pay Indian health-care providers in India. If we are to help bring Indian health-insurance to foreign countries, our business activities will be seen to help promote insurance competition. We should elicit advice from insurance and create a map of the network of insurance providers, especially as to ascertaining their businesses and posture respecting the large corporations and corporate healthcare and retirement plans. We may need to organize our own health insurance business in the United States. Indian insurance companies can then form direct ties with the US insurance company. This structure would allow US citizens to purchase catastrophic health insurance from our company for provider health-care in India, paid by Indian health insurance to Indian providers through contract agreement from our company in the United States. We may then, also negotiate to engage as a captive link for other US insurance companies. Their clients become contractually dedicated to our health-care plans. Some countries have single-payer insurance. The United states has a very complex system. There are HMO, Medicare, PPO, the Blue plans. To carry on business in the United States, we should organize and register our insurance company in the State of Tennessee, as their requirements ask the lowest funds security. We may also make use of a particular Insurance Management Group located in the same state. We start Indicare Insurance, align with certain Indian carriers and the Management Group in Tennessee coordinates and runs this aspect. The utmost consideration is that consumers not be faced with paying for two health-plans in order to include coverage for health-care in India. We should also ascertain governmental employee and retirement healthcare plans. These are necessary for creating alternative, or tangential health plans and tour packages tailored for appeal to corporations and government plans. The health plans of large corporations can be targeted and contrasting health plans can be specifically designed for presentation. Other aspects of insurance, see Growth Aspects at bottom and Banking below. All payments and billing will be handled by indicare. We will coordinate online billing with item-line update, anticipating options and changes, before and during visits. We need to establish a pay by credit-card system, both online and over the phone. We need to establish banking and international transfer. We need to establish understandings about moneys. We could model our activities after Shell Oil. Their corporation is Shell, which is English, partnered with Royal Dutch. The two own Shell. Each is responsible for it's own subsidiary and area. Moneys are kept and used by the subsidiaries and not drawn by one to the other. They function independently and are responsible for all aspects of their endeavors, independently. Each owns equally the umbrella corporation, Shell Oil. A banking system can be created that provides all banking services through a network of international associated banks. These provide medical savings accounts and investments accounts along with all other normal banking services allowing customers to discard their non-participating insurance policies and transfer their banking service needs. banking operations can then be directed into an "Indicare" Medical Service Insurance fund which could become a larger international insurance carrier business. Such a Medi-bank component would become a separate and ancillary business venture. We should ask ourselves what happens if business works but begins slow? What is the estimated profit per patient in the worst case? This evokes an examination of numbers - how big is the business liable to grow and at what rate can we plan? What is an estimate of the volume of cash / per numbers of patients? We should ask ourselves, what happens if the patient load exceeds our wildest expectations? We should devise a plan for fluctuations in workload. Scope of business - Certainly, we should start arranging indicare.net services around dentistry with Global-Dentech in Mumbai. It is our intention to progress actively to broaden the structure and embrace the full range of medical services. We need to define the progress of indicare business expansion. What medical fields to include in our business and in what time-frame. It may be useful, therefore, to create a time chart where we can project profit over a period of time. At some point we should be able to create a time map to project business expansion. I will include an article for the web-site on the structural problems that confront baby-boomers. There is a large nurse shortage in the western countries. California is short 100,000 nurses right now. Most nurses in the west are over 50 and are retiring. At the same time, the looming baby-boomer generation is approaching retirement and the health problems that will ensue with age will burden the West's health system substantially. This very lucrative situation is set for indicare.net to take great advantage. We are poised perfectly to actively pursue this aspect of our business by becoming the most well-known and well-respected of the new India-based health providers. Another lucrative area is enlisting the insurance companies in the west to provide, through indicare.net, their clients with low cost surgical procedures. The pitch can be made that as health problems, such as a needed knee surgery, create other health problems for their clients, we can supply cheap treatments which keep their clients healthy and cost the insurance companies less over time. Another important aspect for growth - indicare.net should advance our service to enlist foreign doctors and hospitals as agents for indicare.net in patient countries. We will invite doctors to arrange for their patients a service package through indicare - for which we will pay to that doctor, or health-provider a percentage. This could grow our provider market-share exponentially. Another area: We should analyze the various large corporate health plans with a view to provide alternatives, for individuals or company wide. We might create a model on which a whole new corporate health plan may be structured and then translated with some ease from one company to the next. We should analyze the social, economic and political implications of taking up the health-care structures of large corporations. We might start a pay online, health advice service. Individuals access and pay online for common health advice. A fee of $5. for ten minutes, $10. for 20 minutes for health advice from an online health care professional. Another area: We will run routed telephone calls for all services. This business will make money but also servers as advertising for indicare.net to create a common, world-wide pointer to our main health services businesses. The online health advice business can be advertised in many ways, including prime-time, and to a broader range of visibility as compared with a health tourism business. 1. We should develop a patient profile document system that will be designed to accommodate all possible medical states. It will be designed to become the international standard. From this international standard, any medical profile can be arranged into a system by which medical analysis, treatments and procedures can be specified from the web. Any person, from any country could assign their profile for medical analysis through indicare. Most importantly, this indicare medical profile system could be placed for use by all medical providers, in every hospital and clinic, every emergency care unit and MASH facility, world-wide. Medical opinion for any medical situation, including emergencies and disaster, could be had on an immediate basis. We would aim for all medical patients and medical providers to expect that our patient profile system will be available for any individual they encounter. We should include in the design process, that the use of our profile system will need to be taught at all medical teaching facilities and universities, world wide. The design of our medical-profile identification number system should be oriented to integrate, as an element, into a larger personal identification profile system. We should expect that any world medical identification system should integrate to, or actually become the world-wide personal identification system. Therefore taps for the appropriate protocols for personal and financial systems and personal web controls for these will need to be considered carefully. The indicare billing operations should grow as a separate business to include provider maganagement services of bookkeeping, schedules and patient treatment flow, management and record-keeping. 2. We can design an online health advice service, see Aspects of Growth above, against a business structure that could grow to include the medical robotics movement where surgical procedures can be performed remotely, - over the internet. This has been done successfully and may very well grow to a world-wide common-place such that patients can be treated at a local facility by doctors in a remote location. Another business to be examined is prosthetics. We could develop a series of materials shops to deliver prosthetics products and market these world wide through private and military care hospitals. These would manufacture products in titanium, graphite and the various advanced carbon products. We have discussed creating a floating Surgery Center. A large luxury liner can be converted to the largest surgery hospital in the world. Multiple surgical theaters can operate with the full range of health-treatment and deliver these world-wide. We would serve the rich countries and poor. My vision is that this ship would be India's health and Cultural Ambassador to the world. This ship would seem more like a luxury health vacation center than a hospital ship. I would like to see it known as the largest floating hospital ever built. Treatments in ports of call would be well-planned and coordinated - surgeries and treatments would be scheduled on a round the clock basis. Travel to ports of visit and to and from the ship would be carefully managed and coordinated with clients and their doctors through indicare teams set up for the purpose, arranging the visits far in advance. .
Clients and visitors can be treated to a full experience of Indian culture. The boat would be sectioned and first class entertainments and aboard-ship lodging for guests while visiting ports of call can be a normal part of operations.